Have you ever been told you grind your teeth? Have you woken up with headaches or a dull pain in your jaw? Or noticed chips or flattened teeth? These are common signs of bruxism or clenching/grinding. 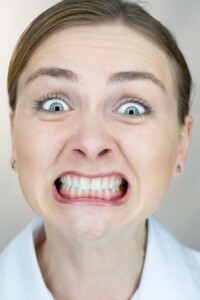 The majority of people who clench or grind their teeth are not aware that they do so. Bruxism can be caused by stress, anxiety, sleep disorders, and even misalignment of teeth. The force of your jaws and consequently enamel (the hardest substance in your body!) pressed against opposing enamel can cause discomfort in your temporomandibular joint (TMJ), as well as the gradual physical wear on your teeth. When you grind away the enamel on your teeth, the next layer, dentin, is exposed. This can cause sensitivity, a higher incidence of decay, and eventually cracks or fractures in your teeth. The best and easiest solution to prevent bruxism damage to your teeth is a night guard. Your dentist or dental hygienist may have recommended a night guard to you. A night guard is one of the best investments you can make in your dental health. They can save you from broken teeth, pain, and even lots of money in the future! Here at Adams and Cheek Dentistry, we make custom night guards that are fit specifically to your mouth. They are made of hard acrylic material which decreases the natural inclination to grind your teeth, as well as prevents the top and bottom teeth from grinding against each other. We take impressions of your top teeth, your bottom teeth, and your bite as they come together. Using all three of these impressions, our lab fabricates a guard that is specifically made for you that is ready in just a few weeks! When you come to pick up your guard, Dr. Adams or Dr. Cheek will make sure it fits correctly and will make any adjustments that you may need. Dr. Cheek often compares putting a night guard in right before bed to putting a watch on right before bed. It often feels unnatural. To improve acceptance of night guards, try putting yours in about an hour before bed and then falling asleep. Store them in a safe place! You wouldn’t believe how many night guards we have chewed up by dogs. Keep them out of reach of your furry friends! Finally, bring your night guard to your routine cleanings and dental appointments at Adams and Cheek Dentistry so we can professionally clean it for you.